It’s day 3 of my healthy Ramadan recipe week with Radikal Kitchen. 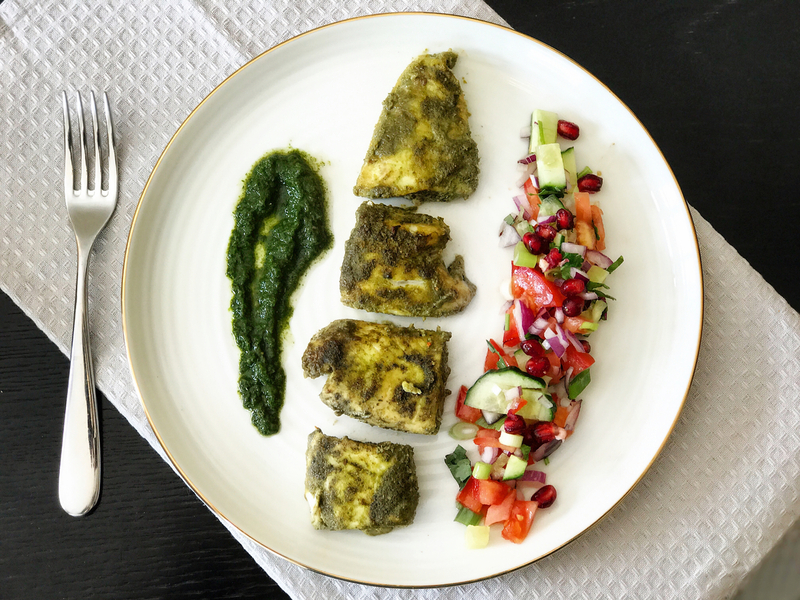 Today’s posts consist of tandoori fish and hariyali fish which you can bake and serve with a light, zesty salad! The baking process is the same for both, however the marinade is different. Be sure to try it out and let me know if you do! Make the hariyali or green paste – grind all the ingredients together except fish and oil. The paste should be thickish consistency and not watery. Add 1 tbsp oil in the marinade. Clean and cut fish into cubes. Place it on a tissue to remove all excess water. Mix well with the fish till well coated. Marinate fish for 30 minutes or longer if you have time. Take glass bakeware and lightly grease the base. Transfer the fish pieces – taking them one at a time and placing them in the baking dish. Leave the extra marinade for a top-up later. Bake in a pre-heated oven 200°C for 20 minutes. Take the remaining marinade in a small non-stick pan and cook for a few minutes. Pour some of the cooked marinade on top of the fish before serving.